Mensa Greece, usually called "Hellenic Mensa", has its office in the Athens area. Hellenic Mensa has a board of 7 voluntary directors each of whom is elected for a two year term. 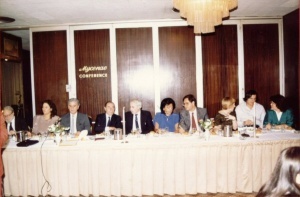 Mensa Greece hosted the 1988 IBD Mensa meeting in Athens. In Greece there is no tradition of IQ-scoring for school or university admission purposes. Thus taking the Mensa IQ Test is the usual way to become a member. There are some S.I.G. and nationwide events of Hellenic Mensa. In Athens there are meet-ups every month and in Thessaloniki almost at monthly intervals. Furthermore there is one annual gathering. This page was last modified on 2 June 2012, at 05:56.